Magento Wallet System module allows customers to make the online payment from their Wallet System. The customer can use Wallet Cash during the checkout and money will be reduced from their Wallet Cash. They can easily add money to their digital wallet. The admin can add or deduct the amount from customer’s wallet. The admin can also create credit rules for cash back to the customers. Magento Wallet System module works as an Online Payment Gateway. The customer can easily add money to their wallet system. Admin can make a refund to the customers for the order purchased and the amount will get credit into the customer’s Wallet. The admin can add cash back feature to the products. The admin can view the customer details who all are using Wallet System. 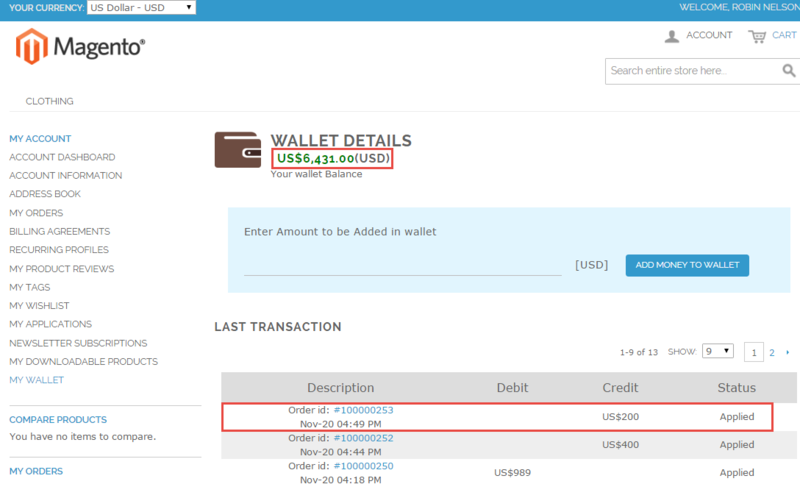 On the checkout page, a customer can view wallet amount used and remaining wallet amount. The customers get notified via email notification for each wallet cash transaction. The admin can configure the maximum and minimum wallet amount limit for the customers. The admin can add or deduct the amount from the Customer’s Wallet. The admin can create multiple credit rules for cashback. Open source module, so it can be customized as per the requirement. 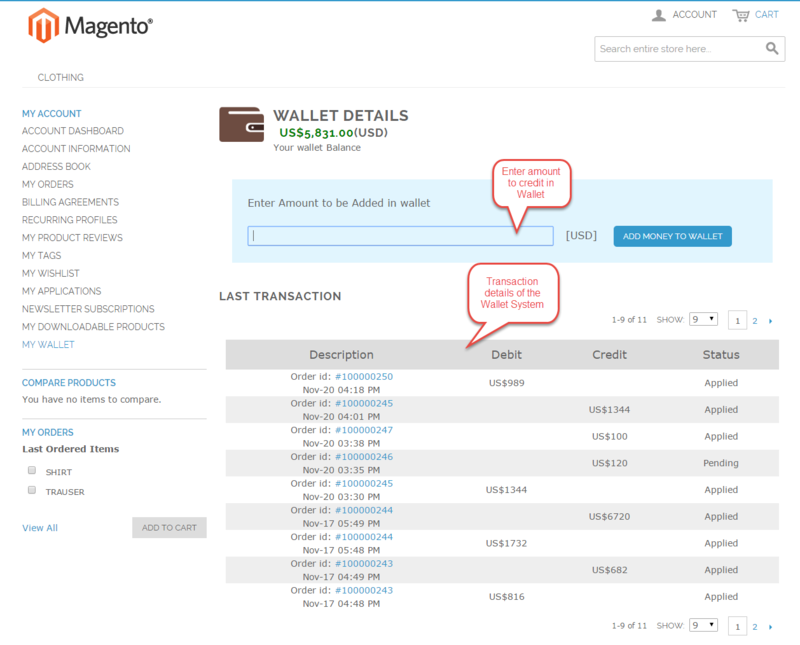 Installation of Magento Wallet System module is very simple. You need to move all folders (app, skin) into Magento root. The user will unzip the folder and click on src folder. Inside that folder, you will find app folder. Click on the app folder and you will get locale and inside that, you will find the language folder in the English language as en_US. 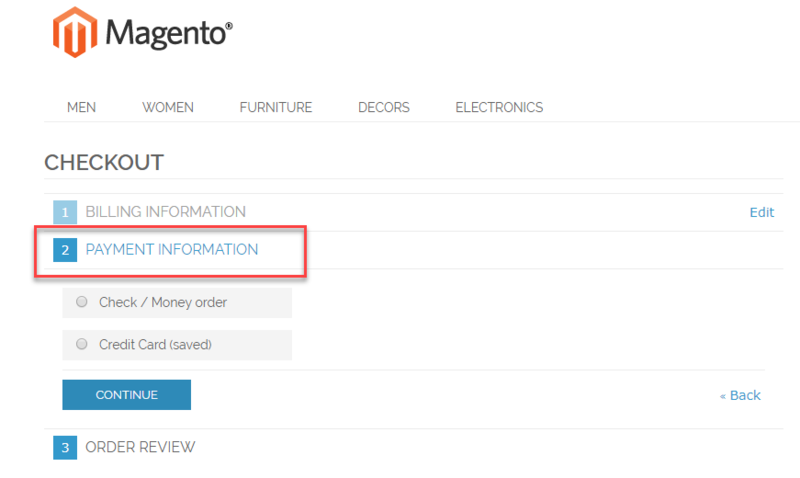 Now follow the same path and open the locale folder where you have installed the Magento Wallet System and go inside the locale folder and create a new folder and name with the language for which you want to convert your module content. Now edit the Webkul_WalletSystem.csv and then upload to your server inside the language folder that you have created. Before uploading the CSV file, open and edit it with the translated keywords. Please check the below image for the better understanding. Title: Enter the title of the Wallet system which will appear on the checkout page. Enter minimum amount limit to add in the wallet: Set the minimum amount the customers can add to their wallet. Enter maximum amount limit to add in the wallet: Set the maximum amount the customers can add to their wallet. Allow payment methods: Enable multiple payments methods for the customers to add money to their wallets. 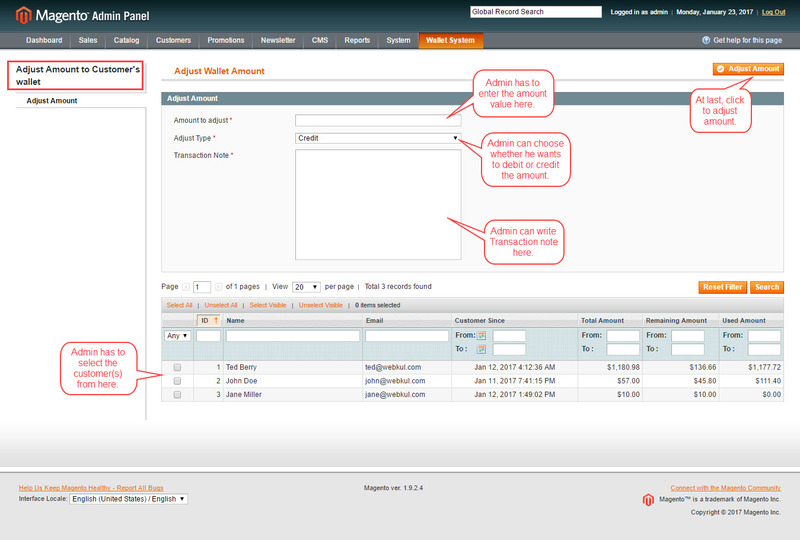 Admin can manage the Magento Wallet System module by navigating to Wallet System tab as per the image. The admin navigates to Wallet History page when clicks on “Show Details” option. Here, the admin can see detailed wallet history of the customer. On clicking on any customer, the admin can view their transaction history (credit and debit) along with the date, order id, amount, status, action and Transaction Note. The admin navigates to Adjusts Wallet Amount page when clicks on “Adjust Amount To Customer’s Wallet” option. There will be a list of customers with the name, email address, Remaining Wallet Amount, Total Wallet Amount at the bottom of the Adjusts Wallet Amount page. 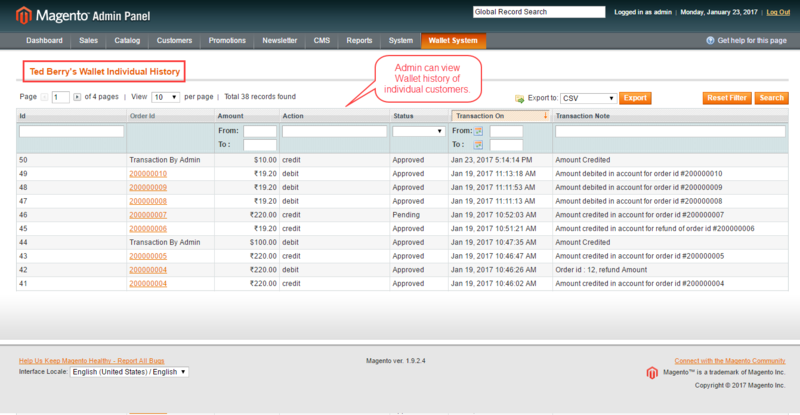 The admin can select the customer from the list for which they want to credit or debit the amount. Amount to adjust: Enter the amount which will get credit or debit as per the action selected for Adjust type option. Adjust type: Select credit or debit option. Transaction note: Add a note for the transaction. The admin navigates to the Wallet Credit Rules page which displays the details for Wallet system Credit Rules in a grid when clicks on the “Wallet System Credit Rules” option. Add multiple credit rules by clicking on the Add Credit Rule button. Delete the credit rules by clicking on the Delete option from the Actions drop-down list. Enable/Disable the credit rule status by clicking on the Update Status option from the Actions drop-down list. Edit the credit rule by clicking on any credit rule from the list. 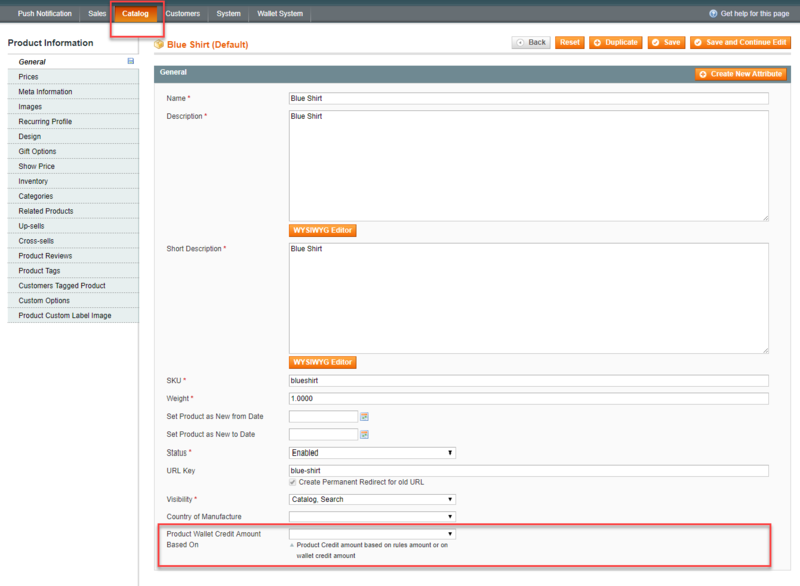 The admin will navigate to “Add Credit Rule” page when clicks on the Add Credit Rule button. Credit Rule Based: Select either “On Cart” or “On Product” option to create credit rules. Cashback Amount: Enter the cash back amount for the customers. Minimum Cart/Product Amount: Set minimum amount for the cart/ product amount. Start From Date: Set the date for the credit rule to be active from. End Date: Set the date for the credit rule to get inactive. Rule Status: Enable/disable the credit rule. If Credit Rule Based option set to “On Cart” then Credit rule will be applied on the basis of customer’s cart total amount. The customer’s cart value should be greater than or equal to the set Minimum Amount for the Cart. If Credit Rule Based option set to “On Product” then Credit rule will be applied on the basis of product purchased by the customer. The purchased product amount value should be greater than or equal to the set Minimum Amount for the Product. 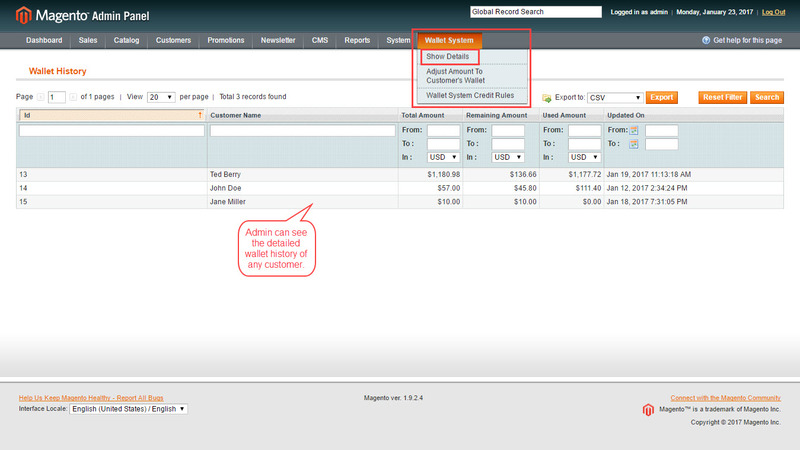 The admin can view the credit rules in the wallet credit rules list after creating them. After this, the admin will set the Priority for Cashback the admin will follow the path System> Configuration > Wallet System. The admin can either select “Cart Based” or “Product Based” for Priority for Cash Back and can select “Fixed or Percent” for Price Calculation as per the image. Then, the admin will go to Catalog > Product. Here, the admin will click on the Edit link against the product for which the admin wants to apply the credit rule. After clicking on the Edit link, the admin navigates to the product edit page as per the image. There will be a field Product Wallet Credit Amount Based On. The admin can either select “Product Credit Amount” or “Cart Rules” option for this field from the drop-down list. 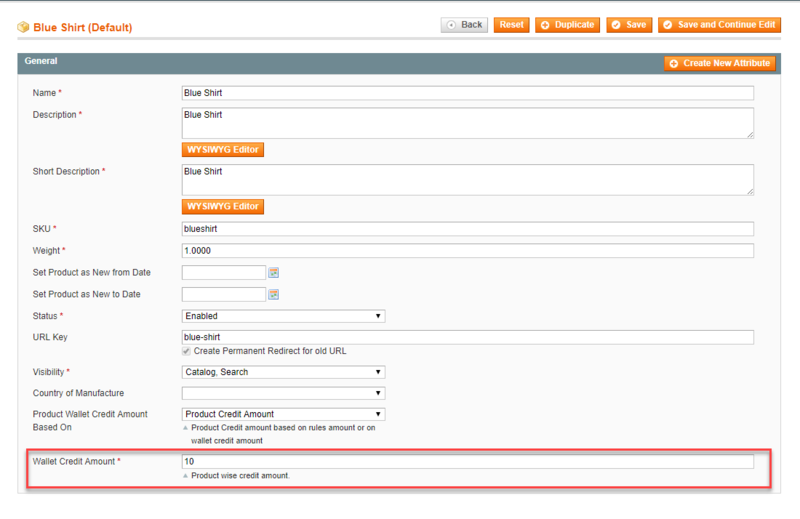 If the admin select “Product Credit Amount”, the another field Wallet Credit Amount gets visible as per the image. Then the amount entered against the Wallet Credit Amount will be credited to the customer wallet on that product purchase. If the admin selects “Rules Amount” then, the amount entered against the Cashback Amount field will be applied. 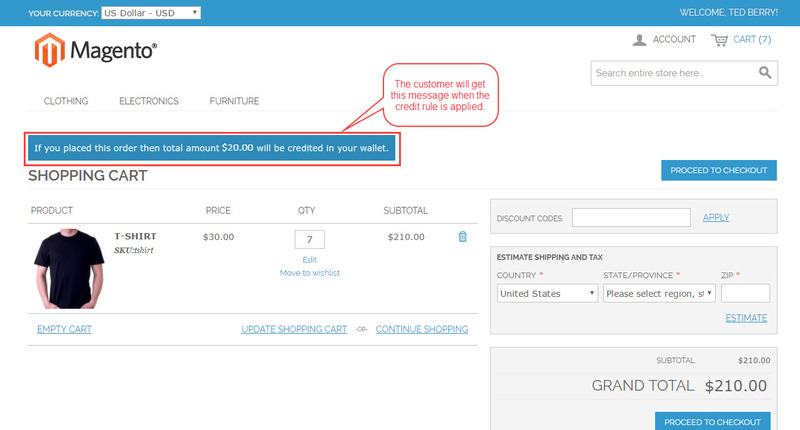 On the checkout page, the customers can see an info message for the amount getting credited in their Wallet. The credited amount will depend on the Wallet System Cash Back Configuration. Example: The admin has created two credit rules, one is based on the cart for minimum cart amount $100.00 at the cash back amount $50.00 and other is based on the product for minimum product amount $100.00 at the cash back amount $25.00. And if the customer has placed an order which has the product price and cart total amount as same. Let’s say, an order has a product worth $100.00 and the cart total also is $100.00. Then which credit rule will be applied on these kinds of orders – cart based or product based? For this, if the “Priority for Cashback” is set as “Cart Based” then Cart Based Credit rules will be applied and if the “Priority for Cashback” is set as “Product Based” then Product Based Credit rules/Product Credit Amount will be applied. The Credited amount is credited to the Customer’s Wallet after order completion. The customer can see “My Wallet” tab in their Store Account as per the below image. After clicking on “My Wallet”, the customer can see their total Wallet Balance, Wallet transaction details ( credit and debit details). The customer can also add credit into their Wallet System by entering the amount into the provided input box. When customer will click on “Add Money to Wallet”, it will be directed to the checkout page where they can see current Wallet amount, credit amount and subtotal amount after credit. Customer will select a payment method for recharging their Wallet System. After making the payment, the customer can see the credited amount in their wallet system as per the below image. The amount will get credited to the customer’s wallet only after the generation of invoice. At the time of making payment on the checkout page, a customer can use Wallet System to make the online payment. The total payable amount will be deducted from the Wallet Amount and customer can also see remaining Wallet amount after making the payment. If the total payable amount exceeds the available Wallet balance, then the customer will have the options of making payment for the remaining amount by the payment methods available for that store. 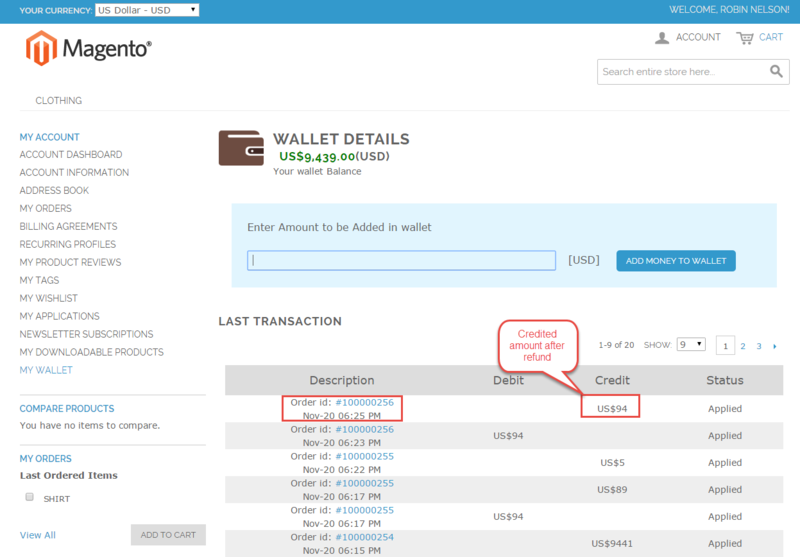 Magento Wallet System allows the admin refund the customer’s amount into their wallet. For making a refund, the order status should be Complete. 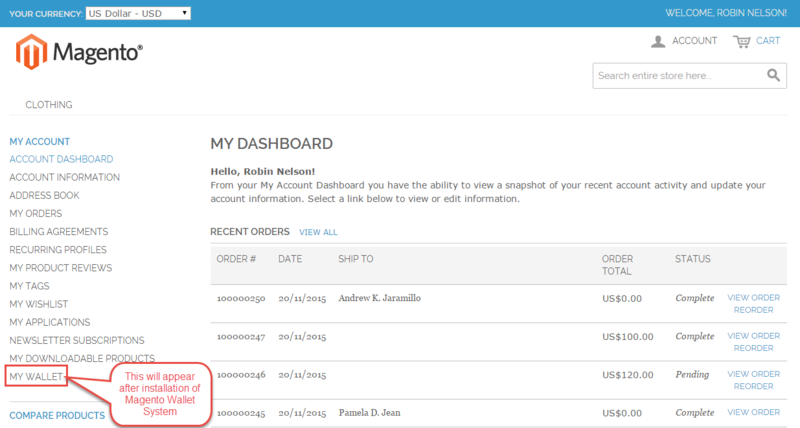 The admin will navigate to Sales>Orders and will be redirected to the orders list page. Here, the admin can select the order for which the admin wants to make a refund. The customer can also see the refunded amount been credited into their Wallet System. can we use this extension for our multiple website or not. you can use this module with the Marketplace but its functionality will not reflect on the seller end as it is a stand-alone Magento Module. We have to modify it to make it work for the seller end. Please mail us at support@webkul.com and we can discuss about the modification needed. -can sellers ask withdrew amount via bank account ?